The bit of a blow that started yesterday and we still have at the moment, though not too strong is creating a nice bit of swell and a decent surf line on Chesil. The main plus to it apart from creating some interesting conditions for Bass, is that it should break up the last of the May water. When I had a look at conditions at Ferrybridge yesterday afternoon the water was clear, but there was a pungent smell of decaying organic matter in the spray coming off the surf I think one more day and we will be clear. 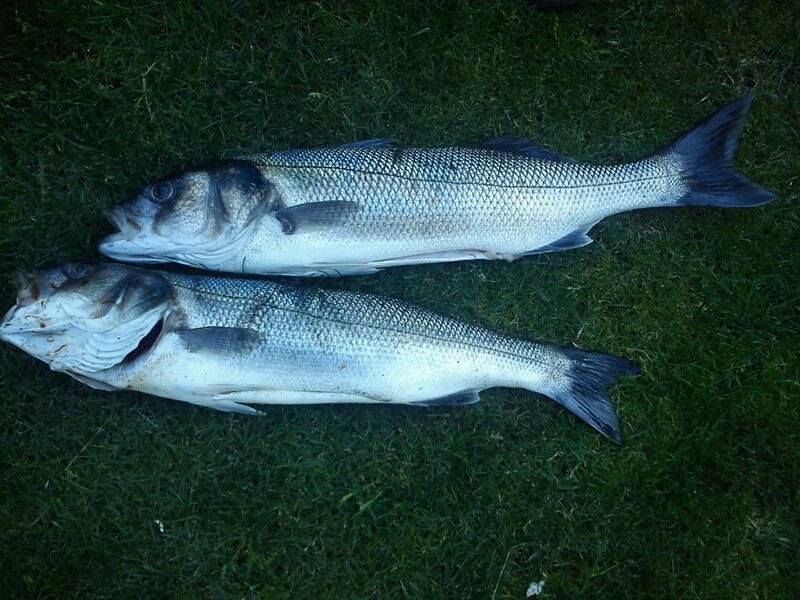 I met one of my mates yesterday, who told me he had seen hundreds of Bass down on Weymouth beach on Tuesday night. I asked him if he was sure they were Bass, as a lot of people mistake Mullet for Bass, especially when they see them jumping. He assured me they were Bass. So we met up yesterday evening in the hope that the Bass would be there are the same stage of the tide. We waded out and fished all along Weymouth esplanade without seeing any sign of life. After 3 hours of fishing into dusk and in the rain, I decided to call it a day. Just as we were about to leave I spoke to the only other angler on the beach. I mentioned to him about the fish my mate had seen the night before. He replied that he had also seen hundreds of fish. All of them MULLET. Just like the ones he had caught a few hours before in the harbour. Just thought I would include a picture of a Bass so that my mate James could better identify them for the future. I know its a bit boring to hear about blanking but I thought I would share my experiences of yesterday with you, if nothing other than to prove I blank just like everyone else: When I woke up I had a quick look at Windguru, the tide table and the camera view of Chesil on my site (yes I know its sad, but its all in the one place). It looked good for a lure fishing session, as long as the May water had disappeared (that I can’t see on the camera). I headed down to Chesil Cove and conditions were almost perfect. The water was the clearest I had seen it in weeks, if not months. A nice surf of just over a metre was crashing into the rocks at the corner of the Cove. I was wondering how many Bass I would get in the 4 (or if I could stretch it with the missus) 5 hour session that I was about to embark on. To cut a long story short, despite clambering for several miles over rocks and boulders and going through my entire lure box I blanked. I was a bit disappointed with myself, as I should have taken note of a number of factors that were missing. Mainly the fact that there was no sign of bait fish. None amongst the rocks and no birds working for them. I should have taken that as I sign to give up and move somewhere else. I will explain more about looking fr signs and how to fish this area in more detail in another article. One angler that didn’t blank was Rob Raybould. 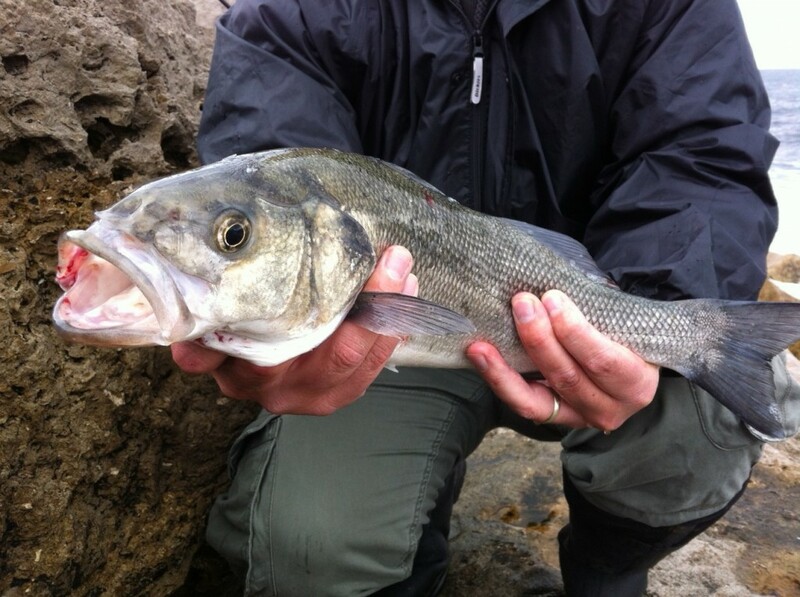 He fished at Abbotsbury with Peeler Crab to land 13 Bass in one session. Most of them were under 30cm, all of which he returned. The largest two which went 57 and 63cm (about 5 – 6lb and before I get shot down thats just a guess), were caught on Mackerel heads. Mackerel heads are a great bait during the summer when the Mackerel are about. Rob tells me that they had some, but they were at distance. Lots of anglers gut there Mackerel on the beach and throw the head and guts into the water. Big Bass are lazy and there is nothing easier for them to do than mop up the gutted left overs. If you are fishing during the summer with 2 rods, pop a Mackerel head on one and lob it out 20 yards. Chesil Beach: A bit of a swell round a metre, with a 10m surf line. At last the water is almost clear. Chesil Beach forecast: Let the games begin!! With the water almost clear I am hoping that we will get back to normal summer service. The Mackerel should finally move back within casting distance. Bream and Gurnard will be able to see the bait and start to feature in the catch reports. Bass and Smoothound will continue to smash rods from rod rests (we can but dream). Trigger fish will arrive in abundance along with my favourite fish the Red Mullet. All this could well happen in the next month and I for one will welcome it if it does. I am sure that the mackerel will be around in good numbers from today and the Bass and Smoothound certainly seem to be playing ball. I have not heard about many Rays being landed since last week, but with growing tides, marks such as Seaton will produce fish. Portland: Wrasse fishing is in full swing. They are really easy to catch on Ragworm. Float fish for the smaller ones if you dont want to risk too much tackle loss. If you are after the larger ones than use rotten bottom rigs and cast into the deep gullies that are abundant around Portland. Use Peeler or Hermit for the bigger ones. To be honest it can be waste of crab at this time of year, because the smaller ones often get to it before the larger ones. Using hard Back Velvet Swimmer crabs that can be caught using a drop net is a god free alternative, that the small ones don’t bother with. It might take you an hour before you get a bite but it coud well be worth it. If you want more of a chalenge on light gear then try catching the Wrasse on soft plastic lures. They are great sport and really test your tackle to the limit. Tides are not great for the Pollock at dusk from the more readily accessible marks such as the Bill or Church ope Cove. However if you go looking for the deeper water areas, of which there are plenty around Portland you can have fantastic fun on lures. Portland Harbour: Bass, Mulet and Flounder feature amongst the catch reports for the harbour. I would love to say the Gilthead Bream and large Thornbacks were also being caught, but as far as my knowledge goes, I would be lying. Weymouth Bay: If you want a Mullet of a life time then I think this week could be your best chance for a very long time. THe harbour is full and I do meen full of big Mullet (and smaller ones). Bread and dog biscuit are the best options of getting these really hard fighting fish.